Disclaimer: This article is not about Donald Trump, or the Alt-Right. This article is about the unusual circumstances present with the Seth Rich murder investigation, and the media’s attempt to rewrite history, and ultimately interfere in a murder investigation. My personal intention for writing this is a desire to seek justice for Seth Rich. The mainstream media has decided the Seth Rich murder investigation is “fake news”, which means they are trying to cover something up. As I’ve written about before, the term “fake news” is used as propaganda to purposely distract the masses from the truth. Whenever the public gets too close to the truth, the mainstream media goes into a frenzy trying to convince anyone who still trusts them into believing a story they do not like has been debunked. The frenzy we witnessed last week by the mainstream media concerning the Seth Rich investigation was by far the most damning evidence I’ve seen yet that something is seriously wrong with the Seth Rich murder investigation. Meanwhile, the only mainstream media running Seth Rich “fake news” stories are the same news organizations who were exposed by the DNC Wikileaks and possibly Seth Rich himself. Hmm. Considering we learned from the DNC Wikileaks that the mainstream media was colluding with the Clinton campaign, that means anything about the Seth Rich case published by ABC, Associated Press, Bloomberg, Buzzfeed, CBS, CNBC, CNN, Daily Beast, GPG, HuffPost, MSNBC, NBC, NPR, NY Post, New York Times, PBS, People, Politico, Reuters, The Hill, Univision, Vice (HBO), Vox, Washington Post (WaPo), the Wall Street Journal, and Yahoo News or any of their affiliates should be considered an unreliable and biased source of information concerning the Seth Rich investigation as they were harmed by the leaks. If Seth Rich is in fact the Wikileaks source, then he exposed all of the above mainstream media just as much as he did Hillary Clinton. Which means anything any of these news sources publish about Seth Rich should be considered less than reliable, as they may even be purposely spreading false information to confuse the public and interfere in the murder investigation. The Seth Rich investigation has major political implications as it can potentially unravel the Russian hacking narrative which is being pushed heavily by the media, prove Wikileaks is actually a source of true information without a political agenda (competing with the media), and furthering distrust between the people of America and the mainstream media. Perhaps this is why many Republicans have also politicized this investigation as to help their own agenda of delegitimizing the liberal media. With that said, the reason I am writing about this is to aid in discovering the truth, and to seek justice for Seth Rich’s family and friends. So please keep in mind I wrote this as an independent who did not vote for Hillary or Donald Trump. Having been involved in an international public murder investigation in my past (see personal note at the bottom of this article for more details), my Mother’s best friend was murdered, I empathize greatly with Seth’s family and friends, and know what they’re going through. I am doing what I can to help by publishing everything I’ve been able to find online since Seth Rich’s untimely murder. What I learned from my experiences is every investigation comes down to three factors: Means, Motive, and Opportunity. The key to dissecting both the Russian narrative, and the Seth Rich Wikileaks narrative is by looking at the content of what was leaked. Having read hundreds of Wikileaks e-mails, I can tell you that the core of what was leaked was in relation to Hillary Clinton’s e-mail scandal and subsequent cover-up (which potentially included President Obama), the rigging of the primaries against Bernie Sanders, and mainstream media collusion with the DNC. There was next to nothing about Russia or other foreign countries (aside from countries Hillary took money from), and barely anything even remotely interesting about Donald Trump since most of the of the leaks were before Trump was even nominated. The people and organizations most harmed by these leaks were Hillary Clinton, John Podesta, the DNC, and the mainstream media. What this means is the person responsible for providing these e-mails to Wikileaks was trying to expose Hillary Clinton’s e-mail scandal, the DNC rigged primaries against Bernie, and media collusion. When you take this into consideration, an American leaker from within the DNC sympathetic to Bernie Sanders makes logical sense and equally needs to be explored in comparison to other theories. Having followed the election closely, I’ve been following the Seth Rich case since the day it happened. When I first read a DNC Data Analyst was murdered I became immediately suspicious, and the events that have transpired since then indicate to me that there is both a cover-up, and a politicalization of the murder investigation on both ends of the political spectrum. By the time Wikileaks started publishing, and eventually issued a reward for information on Seth Rich’s murder I suspected he was likely the source of the DNC e-mails merely based on the technical complexity and amount of data contained within the leaks. However, I will leave it to you to review all the evidence I’ve collected that lead me to this conclusion, and let you come to your own conclusions. With that said, lets take a look at circumstances, evidence, cover-up, and timeline that is currently publicly available at the time of writing this. On July 10, 2016, around 4:20am Seth Rich was shot in the back twice about a block from his apartment in the Bloomingdale neighborhood of Washington D.C. He had been speaking to his girlfriend on the phone just 2-minutes before he was shot, and told his girlfriend, “I’ve got heat” before hanging up. What happened in the next 2-minutes is unknown, but Seth did suffer from defensive wounds, and was eventually shot. Nothing was stolen. Police officers arrived on the scene shortly after, one of which was wearing a body camera (the footage has never been revealed to the public). Seth Rich was conscious when police arrived, and did not die until several hours later at the hospital. Conflicting reports have stated his wounds did not appear fatal. Although police claim this was a robbery gone wrong, nothing was stolen or taken from Seth Rich. The police currently have no publicly announced leads, and anonymous sources close to the investigation have stated the police were asked to stand down. The first thing we need to investigate is the leak itself. The reason I am referring to it as a leak, and not a hack, is because in his final press conference former President Obama himself stated the DNC was the result of a leak. Obama addresses whistleblowers, inconclusive Russian evidence, and Wikileaks around 7–9 minutes into the video. President Obama had absolutely no motive to refer to the DNC situation as “a leak”, and I believe Obama was telling the truth when he stated the DNC e-mails were leaked, and not hacked. He knew the difference, and this was not a slip of the tongue. This was Obama’s final press conference as President, and I believe he was trying to be honest with the American people in his final moments as President. Despite Obama’s statement otherwise, this narrative insists that the DNC e-mails were hacked by Russian agents and given to Wikileaks and were not leaked by a whistleblower. This narrative argues the Seth Rich Wikileaks narrative is “fake news” and that Seth Rich’s murder is a mystery. The desired conclusion this narrative wants you to come to is Seth Rich’s death is unrelated to the DNC, and his murder was some random unconnected coincidence. Julian Assange, the founder of Wikileaks has consistently denied the allegation that Wikileaks received anything from Russia or Russian agents. No proof of the media’s claims have been made available publicly, and the FBI was not allowed to examine the DNC’s servers. The only company who had access to the server and who conducted the investigation was a cyber security firm named CrowdStrike. The founder of CrowdStrike has ties to Hillary Clinton. Meanwhile, what has been released by intelligence agencies was inconclusive. According to a recent leak, Vault7, it was revealed that the CIA is capable of faking the fingerprint origin of a hack to make it look like it came from a foreign agent hacker or country. It was also leaked that most of the CIA’s tools leaked online so they could have been used by anyone including the DNC and CrowdStrike to plant fake evidence. Motive: Russia wanting to elect Donald Trump instead of Hillary Clinton by exposing her corruption. Opportunity: It is both unproven and unknown if Russian agents even had access to the DNC e-mails. This narrative is based on information from the previously mentioned cyber security firm with ties to Hillary Clinton, and anonymous sources with no direct evidence indicating Russian agents were able to download and leak the e-mails without being noticed. The FBI was not allowed to investigate the server. Seth Rich, the murdered DNC Data Analyst, was a Bernie Sanders supporter who contacted Wikileaks as a whistleblower and provided Wikileaks with the DNC e-mails to reveal the DNC’s corruption in rigging the primary elections against Bernie Sanders, expose Hillary Clinton’s e-mail scandal, and collusion with the mainstream media. Aside from President Obama stating this was a leak and not a hack, the next best supporting evidence for this narrative is Julian Assange, the founder of Wikileaks. Assange has made several public statements about Seth Rich, although Assange has not confirmed Seth Rich was Wikileaks source, he continues to invoke his name in reference to the DNC leaks. Wikileaks even posted a $20,000 reward for information in the case (the DNC has never offered a reward). In addition, one of Wikileaks operatives, Craig Murray, went rogue and publicly stated he personally met with a “disgusted” DNC whistleblower in Washington D.C. Murray also claims the leaker had legal access to the e-mails, and their motivation was to reveal corruption within the Clinton Foundation, and for swaying the primary election against Bernie Sanders. Assange was not happy with Murray after his statements. Means: Not officially confirmed by Wikileaks or law enforcement authorities, confirmed by outside sources including Kim Dotcom, and a private investigator who has since recanted. Motive: Reveal the DNC’s corruption in rigging the primaries against Bernie Sanders, expose the truth about Hillary Clinton’s e-mail scandal, and collusion between the DNC and the mainstream media. Opportunity: Seth Rich had access to all of the DNC’s data and e-mails, and had intimate knowledge of their computer systems. It was his job to have access to this data. 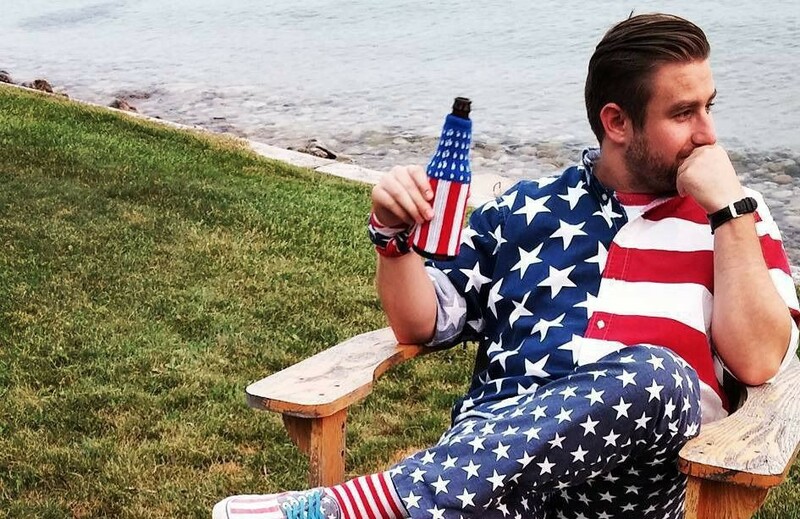 Note: Seth Rich’s social media accounts have been leaked by public investigators online, and have been mysteriously scrubbed of their personally identifying information by Reddit as part of some bizarre cover-up. So far the mainstream media has gone to extreme lengths to debunk, and “fake news” the Seth Rich story. This alone makes me suspicious as these are the same media organizations who were implicated in the leaks. Meanwhile, if Donna Brazile is in fact threatening private investigators, the Podesta family has influence within the D.C. Police department, and the mainstream media is doing everything they can to distract and mislead the American people then something is seriously not right. In fact, the Washington Post, which is owned by Jeff Bezos the founder of Amazon who has a $600 million dollar contract with the CIA, has even gone as far as publishing articles claiming that even if Seth Rich is the DNC whistleblower that the Russian hacking narrative is still somehow true. It gets worse, the most obvious cover-up so far involves the employees who work at Reddit. For some reason, shortly after Seth Rich’s Reddit account was discovered, the admins at Reddit decided to remove personally identifying information confirming the account belonged to Seth Rich. 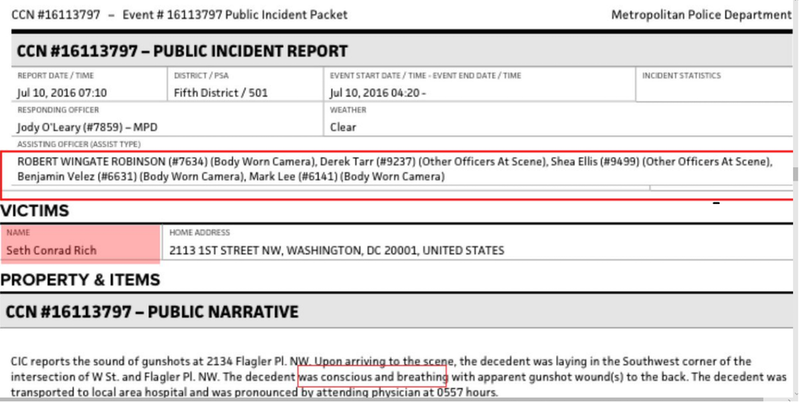 Meanwhile, the area Seth Rich was murdered in contained many surveillance cameras, the police were wearing body cameras, and the bar Seth had been at earlier in the night also contained cameras but law enforcement never went to the bar or interviewed the staff. No footage from that night has been revealed publicly, and it seems police did not investigate or attempt to recover footage related to this case. It is also unknown why the police took Seth Rich’s laptop if they truly believed this was a robbery gone wrong. According to anonymous sources within law enforcement, as revealed by Fox News (who has now removed their story), Seth Rich was in contact with Gavin MacFadyen of Wikileaks on May 21, 2016 (who eventually died of lung cancer in October of last year). The last date of leaked emails is from May 25, 2016. These are the facts I’ve been able to collect over the past year. They lead me to believe Seth Rich was a whistleblower, and was murdered for political reasons. Below is a timeline of events I crowdsourced from various sources and did my best to verify the information. December 2013 — Seth Rich (/u/MeGrimlock4) asks Reddit for DC volunteer opportunities and mentions “things starting” in January. Prefers to volunteer at soup kitchens over working with kids. —This is from the recently discovered and confirmed Reddit account of Seth Rich. Note: John Podesta now works for the Washington Post. March 2015–Paul Cobetta, a Platte River Networks employee working for Hillary Clinton, permanently and irreversibly deletes the email archive of Hillary Clinton using software called BleachBit likely under orders from Cheryl Mills, an attorney for the Clinton Foundation. Cobetta received advice on Reddit under the user name “stonetear” on how to delete e-mails for a “VIP”. The evidence under congressional subpoena is completely destroyed, including e-mails sent between Hillary Clinton and former President Obama. September 2015 — Josh Uretsky joins Bernie campaign as national data director, an associate of Seth Rich. October 2015 — Clinton Email Testimony. December 2015 —Paul Cobetta is given the project of creating weekly reports of emails being sent or received over a certain size; again goes to Reddit. December 16, 2015 — NGP VAN applies new patch to DNC servers. According to email 15792, due to a “glitch in the code” the normal system barriers were lowered for four hours and users could access other users data. This data could still only be accessed by other DNC user accounts (including members of the Bernie Sanders campaign), which enabled four unique users to run and download the results of 25 unique searches which they saved to private hard drives. February 2016 — Paul Combetta (/u/stonetear) meets with FBI and denies deleting any emails. February 2016 —Paul Combetta asks Reddit about overcoming firewalls and VPNs in a series of posts. May 2016 — Paul Combetta gives Reddit Hillary Clinton’s IP address and domain while struggling to install a VPN. May 2016 — Paul Combetta and Bryan Pagliano are offered immunity deals by the Department of Justice. Paul Combetta finally admits to deleting Hillary Clinton’s emails. May 3, 2016 — Bernie pulls off surprise primary victory in Indiana Primary. May 17, 2016 — Bernie wins Oregon primary (final Democrat primaries, including California were still upcoming in June). May 21, 2016 — WikiLeaks Director Gavin MacFadyen reportedly receives DNC email transfer from Seth Rich according to anonymous sources who relayed the information to a private investigator (who has now recanted after supposedly being threatened by former DNC chairwoman Donna Brazile). Note: Brazile was the same DNC employee who gave Hillary Clinton debate questions from the CNN debates against Bernie Sanders. May 25, 2016 — Date of the last email in the DNC Email Archive released by Wikileaks. June 12, 2016 — Bernie Sanders endorsed Clinton in Portsmouth, New Hampshire. June 14, 2016 — DNC hires Crowdstrike to find the “Russian hackers” who have been hacking the DNC for over a year. Claims that the past week has included purges to staff to weed out hackers. July 2016 — FBI recommends not charging Hillary Clinton or aides for mishandling classified information. July 2016 — DNC is served with a class action lawsuit for rigging the primaries before Wikileaks even publishes anything. July 5, 2016 — Seth Rich is invited to Hillary Clinton’s campaign team according to Joel Rich in an August 16 interview (Source). July 10, 2016 — Seth Rich Murdered. July 22, 2016 — Wikileaks publishes 19,252 emails and 8,034 attachments from the DNC, including emails from seven key DNC Staff members. The leaked DNC emails have a date range of January 2015 to May 25, 2016. August 2, 2016 — Amy Dacey, CEO of the DNC and Seth Rich’s boss, resigns amidst controversy. August 16, 2016 — The Chief of DC police conveniently exits stage left after only a month of the Seth Rich murder to some cushy position with the NFL as “head of security”. Note: John Podesta’s ex-Sister in law is on the board of directors of the DC Police department (link, archive). September 18, 2016 — Paul Combetta’s /u/stonetear account on Reddit purges all posts after being discovered by Internet investigators. October 2016 — Wikileaks publishes Podesta emails. October 2016 — WikiLeaks Director Gavin MacFadyen dies of Lung Cancer. May 15, 2017—Fox5 in Washington D.C. revives the publics interest in the Seth Rich investigation with new evidence from a private investigator, Rod Wheeler, claiming Seth Rich was in contact with Wikileaks. Wheeler, claims the police and FBI have stonewalled his investigation, and believes Seth Rich’s laptop has clues but no one knows where it is, and police were told to stand down. May 16, 2017—Fox News takes this story national confirming more details from the private investigator. The story has since been recanted. Seth Rich’s family has refuted the claims of Wheeler, and Wheeler has redacted some of his statements after being threatened by Donna Brazile. ABCNews claims the FBI is not involved in the case (note: ABCNews was implicated in the DNC Wikileaks). May 23, 2017—Kim Dotcom releases a statement confirming Seth Rich was in contact with him, and Wikileaks. Kim claims Seth Rich was opposed to government corruption. Several years ago my Mother’s best friend was murdered on the Caribbean Island of St. Martin (which is half Dutch, and half French). The story went international, the mainstream media got involved, and my Mother had to coordinate the French, Dutch, German (the primary suspect was German), and USA governments (my Mom’s friend was an American). In the end, we had enough evidence to determine who murdered my Mother’s best friend, but we were never able to recover her body, and under Dutch law were unable to bring the murderer to justice. While this has absolutely nothing to do with the Seth Rich case, the reason I bring this up is because I have personally experienced an international murder investigation first hand. I’ve been interviewed and worked with mainstream media and seen how they manipulate the truth, spread false information, and don’t verify sources to sensationalize a story. Over the course of the investigation I worked with law enforcement and former military personnel giving me key insight into how they operate and the chaos that is a public murder investigation. My heart truly goes out to Seth Rich’s family and friends, and I hope by publishing this more people will be skeptical of the media, the DNC, and the unusual circumstances surrounding this case.